Thread Industrial Co., Ltd. was established in December 26th, 1987. Our array of products includes nuts, bolts, small screws and more for wide applications in construction, auto parts, industrial machinery, etc. We offer a diverse range of products in a full array of sizes. The 46B machine is the world’s largest nut cold forging machine right now. 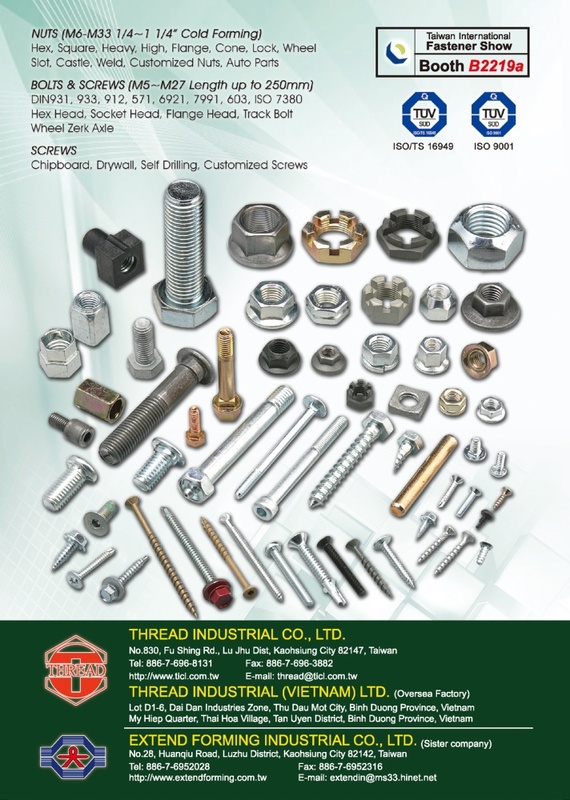 In addition, Thread Industry is also one of the few manufacturers capable of producing nuts, bolts, and small screws at the same time in Taiwan. We had acquired international certification ISO-9001, ISO/TS16949 and ISO/IEC 17025 for TAF laboratory. Our products meet the EN14566 and EN14592 CE Mark standards. In 2003, we established an overseas plant: Thread Industries (Vietnam) Ltd. in province of Binh Duong, Vietnam to provide customers with optimally diversified, professional, and rapid service.